"Chasin' Parked Cars" 2019 available March 10th on Itunes! Support “Rub Some Dirt On It Tour” and donate to my GoFundMe Tour Campaign! My passion for writing has seen it's loose ended days through journaling, poetry, and short stories in college. But I'll never forget the day my friend taught me those powerful three basic chords and I connected to the utmost intoxicating feeling in the power of lyrics and music. As Willie Nelson said, "All you need is three chords and the truth." I later sat in my tiny Albuquerque, New Mexico desert adobe studio apartment, swamp cooler running, and strummed the ol' familiar "C chord" while whispering the words "My Heart is Breakin'" and I haven't looked back. If you've ever sat around a campfire with me, sat across the table and chatted over coffee, or next to me on a bar stool, you know I am a storyteller of travels, friends, family, situations, laughter, and heartache. Well I am now bringing my stories to life through song with lyrics we can all relate to. I have been a working musician chasing my dream for about 6 years now trying different dynamics from working at a record label, playing bass for a Montana based singer songwriter, playing rhythm guitar in my first band meanwhile writing songs and managing, recording efforts of two previous EPs including "Chasing Down the Sun" and "Hey Love, Hold On" to finally settling in as a self-titled lead singer rhythm guitar player who manages to wrap her life around a dream she is committed to. I have had the biggest support from family and friends, not to mention the network of musicians and folks in the industry who continue working with me to help curate my dream. I would not have made it this far without their loyalty. But the greatest effort I've accomplished has been learning to believe in myself to keep going, to try new paths, stay positive when in doubt, and stay true to my belief in what I am doing. I hope to continue inspiring people to reach for their dreams or goals. This album is solely based on transition and movement through tough times and the efforts of letting go and moving forward. There’s something about the expansive landscapes of the western United States — big skies, mountain passes, open roads — that tug at our sense of adventure, prying us loose from the big city, pushing us to explore the vast country on the horizon. It’s a feeling that seems to flow through the music of Terri Lynn Davis, and for good reason. She’s bounced around the West for a number of years since uprooting from her native New Mexico, finally settling in our home base of Portland, OR, USA. It’s here that she’s mingled among the burgeoning country music scene, making connections and impressing with her singing and songwriting chops. 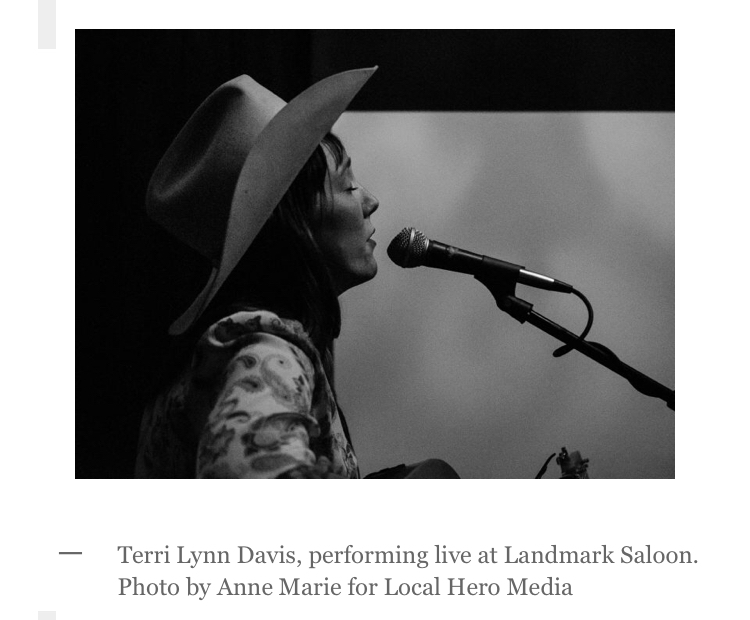 We were thrilled to rope the always energetic Terri Lynn into our world for Episode #91 of That Much Further West Podcast, recorded live at Landmark Saloon in SE Portland. On the show, she talks about moving around the western states after graduating from college, eventually picking up the guitar to start writing and performing in Montana. She speaks about finding her place the local country scene, and some of the artists — such as Jaime Wyatt and Alice Wallace — who inspire her by their hard work and dedication. She also shares a few live performances of songs from her “Hey Love, Hold On” EP, which she recorded in Portland about two years back. Recently, Terri Lynn has been in the studio recording new songs and also performing locally, but the road is always calling. She’ll be undertaking a long trip that will take her through the wilds of Texas in the early part of 2019, so be sure to keep an eye out for her. In the meantime, enjoy this latest bit of fun — here’s the playlist for Episode #91. This entry was posted in Podcast and tagged Alice Wallace, Def Tones, Gary Morris, Hey Love Hold On, Jaime Wyatt, Metal Yoga, Montana Love Song, Ryan Oxford, Terri Lynn Davis, Tin Silver, Wild Hare Festival, Yonder Blue by philfavorite@gmail.com. Bookmark the permalink. Country music has long held a fascination for me – it seems so simple, to tell a story in song…but it’s harder than it looks (or sounds). The ingredients of a song: the lyrics, melody, harmonies, instrumentation, flow, and dynamics – they all tell a part of the story. When combined, the end result is dramatically more than the sum of the individual parts. Yonder Blue has really grasped the idea of honest and heartfelt storytelling in a way that is very appealing. Terri Lynn Davis and her band have thought through the stories from introduction to plot and conclusion.